Need a good, healthy distraction from finals preparation and paper writing? Of course you do (those whole three in the hours really wiped you out for the rest of the week)! Luckily, you can find a festive way to procrastinate at oh-so-lovely University of California Botanical Garden at Berkeley. 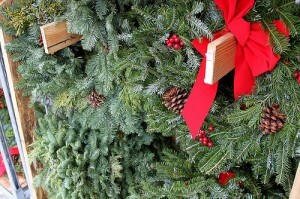 Tomorrow, from 6 to 9 p.m. take a pair of hand pruners and head up to the garden for their Evergreen Wreaths and Garlands workshop ! No essay seems too monumental after you’ve made your own holiday decorations, right? Registration is required, so send ‘em a quick email saying that you’re planning on going. Oh, and swing by the bank before you go—the event costs $30 for non-members.